↑ 1.0 1.1 Thelin, John R. (2004). A History of American Higher Education. Baltimore, MD: JHU Press. p. 448. ISBN 0-8018-7855-1. ↑ Battle, Kemp P. (1907). 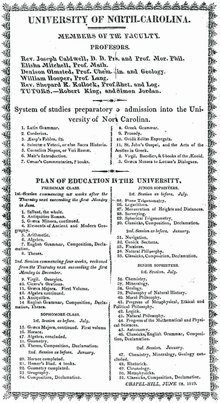 History of the University of North Carolina: From its beginning until the death of President Swain, 1789–1868. Raleigh, NC: Edwards & Broughton Printing Company. p. 6. ↑ As of December 20, 2016. "Comprehensive Annual Financial Report" (PDF). The University of North Carolina at Chapel Hill. 2017. ↑ "UNC-CH: Carol Folt starts new era as 11th chancellor". UNC. July 1, 2013. Retrieved July 21, 2014. ↑ 5.0 5.1 "Employees by Category, Fall 2013". The University of North Carolina at Chapel Hill Office of Institutional Research and Assessment. January 10, 2014. Archived from the original on February 23, 2014. ↑ "Fall 2015 Headcount Enrollment". The University of North Carolina at Chapel Hill Office of Institutional Research and Assessment. September 29, 2015. Archived from the original on December 22, 2015. ↑ "Quick Facts". UNC News Services. 2007. Archived from the original on September 7, 2004. Retrieved April 5, 2008. ↑ "Carolina Blue & Color Guidelines". The University of North Carolina at Chapel Hill. Retrieved July 20, 2017. ↑ Wootson, Cleve R., Jr (January 8, 2002). "UNC Leaders Want Abbreviation Change". The Daily Tar Heel. Chapel Hill, NC. Retrieved July 9, 2012. ↑ "UNC Women's History | Carolina Women's Center". Womenscenter.unc.edu. Archived from the original on February 3, 2013. Retrieved December 21, 2012. ↑ "North Carolina Collection-UNC Desegregation". Lib.unc.edu. Retrieved December 21, 2012. ↑ Snider, William D. (1992). Light on the Hill: A History of the University of North Carolina at Chapel Hill. Chapel Hill, NC: UNC Press. pp. 13, 16, 20. ISBN 0-8078-2023-7. ↑ "C. Dixon Spangler Jr. named Overseers president for 2003–04". Harvard University Gazette. Cambridge, MA. May 29, 2003. Archived from the original on June 21, 2003. Retrieved April 5, 2008.